Are you tired of preparing and unloading all your camping gear from your car and of travelling in an uncomfortable manner ? You’ve had enough of installing your tent after a long travel journey? 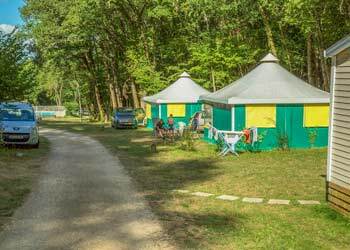 Choose the glamping option in Périgord! 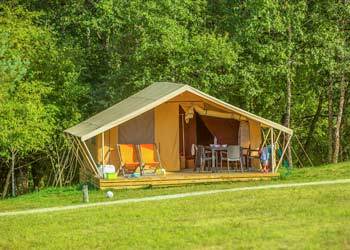 If you love traditional camping and are looking for an original roots rental, choose one of our well-equipped Cottage or Kanada tents. You will appreciate the comfort of our large glamping tents which are well-equipped and cozy while being close to nature. Once you arrive at our camping, all you have to do is to put away your clothes and you are ready to enjoy your vacation. No fatigue, no loss of time setting up your tent, you can start your nature vacation right away! Freedom is yours! All our tents are close to a beautiful oak tree forest. They are installed on a large half shaded pitch. Every morning, you’ll wake up to the sound of singing birds. If you are early risers and very silent, you could admire the forest animals from your terrace : deers, squirrels, hedgehogs, woodpeckers, owls, various birds of prey and sometimes some wild boars which could get close to your mobile home. At night, you’ll enjoy beautiful skies full of stars and in August you’ll be able to see many shooting stars. 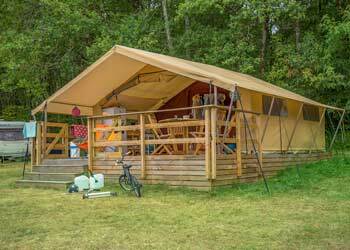 Our glamping tents will please you whether you visit us as a couple, a family or a group of friends. They can welcome up to 5 people. Our Cottage tents have beautiful views on the Nizonne valley and are unoverlooked. From your tent you’ll be able to keep an eye on your children while they will be playing in a 4 hectares field, in one of our kids games area or at the Homeball court. The total area of the Cottage tent including the wood terrace in front is 35m2 : 25m2 of interior area with the living room and the 2 bedrooms and a 10m2 terrace. The terrace has tables and chairs, lawn chairs and a gas barbecue. There is no bathroom in the Cottage tent and as authentic roots campers, you’ll have to get to the sanitary unit. The Kanada tents are installed on 25m2 of smooth concrete slab. There are a table and chairs as well as lawn chairs on the 12,50m2 wood terrace. Inside are 2 bedrooms, a well-equipped kitchen and a complete bathroom with toilets, sink and shower. The same comfort as in a mobile home but as close to nature as it gets in a tent. You’ll be able to rent a baby bed, baby chair as well as disposable sheets.